He was seen in distress after he came out bowling for the Scorchers. The match between Adelaide Strikers and Perth Scorchers in the 2019 Big Bash League (BBL) on Saturday saw some bizarre developments at the Adelaide Oval. 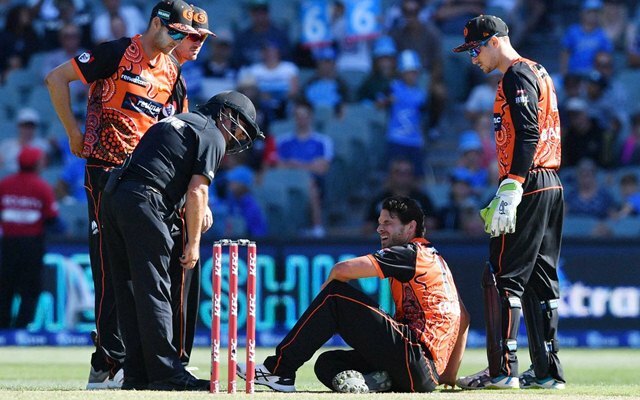 Scorchers’ fast bowler Nathan Coulter-Nile had to be given medical assistance not because he was hit by a ball or fell down during fielding but because he had a bout of vertigo. The 31-year-old, however, had a good match with a score of 25 runs off just eight balls and then two wickets for 28 runs in his spell of four overs. Coulter-Nile was seen in distress after he came out bowling for the Scorchers and sat on the ground. Medical staff members came to his help and he was taken to the hospital. The player, who has been picked for Australia’s upcoming limited-over series in India, felt uneasy after bowling the fifth delivery of an over towards the end of the game and after consulting his captain Mitchell Marsh, he bowled the final ball which was belted for a six by Strikers’ Harry Nielsen. Coulter-Nile was then seen sitting on the ground. Coulter-Nile’s team, however, lost the game by 5 wickets as the Jonathan Wells (69) and Harry Nielsen (44 not out) powered the Strikers to a win in 19.2 overs. The game though was inconsequential as both the Scorchers and Strikers, the defenders, have lost in the race for the playoffs in this year’s tournament. The Strikers did better compared to the Scorchers by finishing at 12 points from 14 games while three-time champions Scorchers ended last in the table with just eight points from as many games. Coulter-Nile, who has also played in the Indian Premier League, has represented Australia in ODIs and T20Is, taking 38 and 30 wickets, respectively, in those formats.